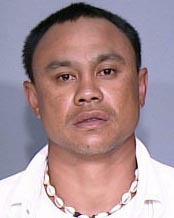 Big Island police are asking for the public’s help in locating a 40-year-old man wanted on an outstanding warrant. Sheldon Joaquin is wanted for violating terms of probation for an assault conviction. He is described as local, 5-foot-6, 150 pounds with a tan complexion. He is known to frequent the Hāmākua and Waipio Valley areas.